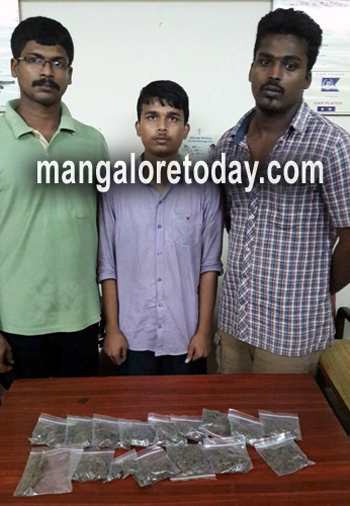 Mangaluru, July 12,2016 : Three youth including two students were arrested by the Barke police on July 11, Monday on the charges of drug peddling near MG Road. As many as 18 packets of ganja weighing 250 grams were seized from the trio. Those arrested are Sridhar (20) of Bijapur, a B.Com student, Johnson Selva Kumar, a final year degree student and Dhanush S Kumar (26) from Kodikal. Dhanush worked for a shipping firm. Barke police raided a place at MG Road following a tip off. Interrogations of the accused revealed that they used to purchase ganja from a person named Rahim from Bunder and sold the same to students and others. It is learnt, Rahim alias Kindi who has at least five cases against him was presently at large. They were found in MGRoad means the college area. Give a dose of it to their family let them suffer . Will they agree? With help of the arrested destroy the whole ganja peddlers racket.What do the police do to these people?